PMOG.org is the Passively Multiplayer Online Game web site. Its a nifty little idea. Really! This is the little tool bar that is displayed at the bottom of your browser after installing the PMOG Firefox addon. Of course you need to create an account at the PMOG.org web site as well. But once you're signed up then its time to go on a MISSION. This is one of the ways you'll start a mission. This little popup appears when a new mission is available and you can Dismiss, or Take this Mission. 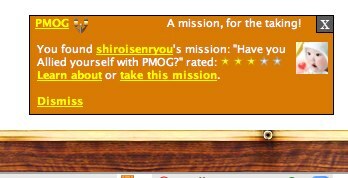 They all start out with "You found __________'s mission:..." so I'm assuming that when you create a mission for others you can have that mission starting point triggered when a PMOG player lands on a specific web page. Don't worry...if you are totally lost then let me back up and explain this thing. Okay...well...maybe I can't explain this thing. Take the first learning mission about the game. But I can absolutely see some VERY cool uses for learning. Actually, the first mission I took was a learning mission. The mission took me to several web pages teaching about Superdelegates! It was very cool and YES, Very educational and informative. There are other game elements that I don't have time to explain but I would encourage you to signup and then comment on this post. I will "Ally" with you and we can go on missions together and create missions for others as well. I see great potential in this...or something like it...for Game-based eLearning.